from rock, slag, or glass, with or without binders. material standards cover mineral fiber products. primarily by maximum use temperature. used with a heat-up schedule. in/(hr ft² °F) at a mean temperature of 100°F. with austenitic stainless steel piping. comply with the higher temperature requirements for Types II, III, and V.
range from ½” to 6″. 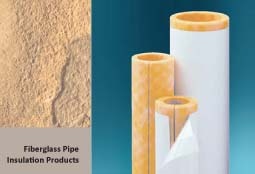 insulation for commercial and industrial applications is covered in ASTM C553. characteristics, corrosiveness, and shot content. be specified with various factory-applied facings, or may be ordered unfaced. by maximum use temperature and thermal conductivity. removed as a requirement in ASTM C612. with the higher temperature requirements for Types IVA, IVB. specified with various factory-applied facings, or may be ordered unfaced.